I want you to ask yourself and be honest and think about it. Have you been with JESUS since last Sunday. I mean really spent time with HIM. Do you make it a point to be with HIM every day? If you’re walking down the street and JESUS was across the street walking towards you. Would HE wave to you because HE knows you or would HE come across the street to witness to you. We can and we get to spend time with JESUS. We just have to make the time. I’m here to encourage all of us to hang out with JESUS. This way we can make what happened in the Bible the normal way of life. 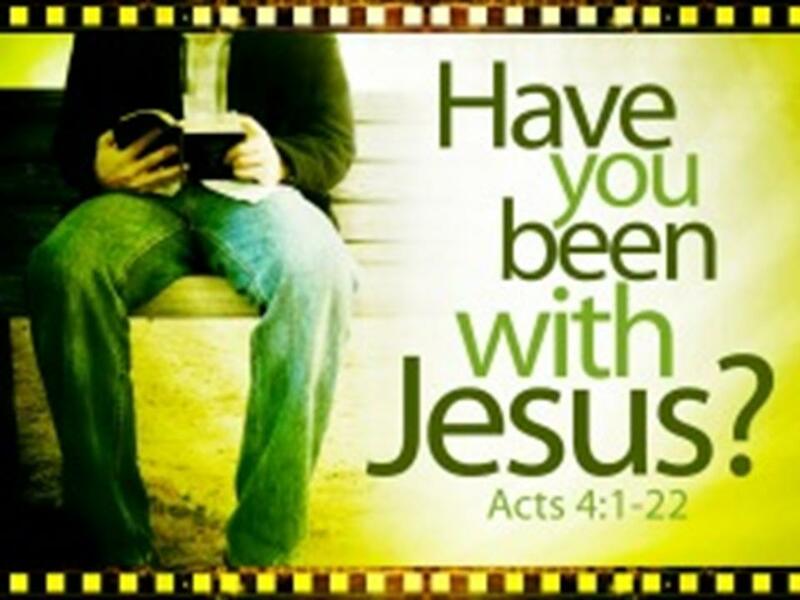 When people look at you, can they tell that you been with JESUS? In the eyes of many people back in the day, JESUS was not the Messiah they were hoping for. Pilate washed his hands of him. The Pharisees were glad to get rid of him. The people didn’t care anymore. But when Peter and John came to town, it didn’t take long for people to realize that “they had been with JESUS.” When you got around these men you could feel the presence of JESUS. Can you feel HIS presence now and in your home? When you hang with JESUS and see what HE’S about, you’ll have compassion on people like HE does. Remember Peter and John were going to the temple to pray and saw this man at the gate begging for money. Peter told him to look in his eyes then said “Silver and gold have I none but such as I have I give thee: In the name of Jesus Christ of Nazareth rise up and walk”. Satan has hijacked thousands of people so their lives would crash and burn. We need to rescue the lost before it’s too late. Give them the Hope in JESUS. Where can we get the courage to lead people out of darkness and show them the light? By spending time with JESUS. We need to be 100% sold out to JESUS. We need to be committed to HIM. We can’t let anything get in the way of our time with JESUS. There should be nothing that means more to us than JESUS. Peter and John were not only committed to preaching about Jesus. They were also committed to pleasing JESUS. They didn’t care about pleasing men. All they cared about was pleasing God. We should be so close to Jesus that we always strive to please Him and not man. How can you tell if someone has been with Jesus? If we have compassion, courage, and a commitment to JESUS, then you can tell that someone been with JESUS. We should have such a close relationship with our LORD that when others see us, they can tell that we have been with JESUS.